Yesterday, the name 'Cleopatra' was trending on Twitter. Why? Because the long delayed film project on the Egyptian ruler, first conceived with Angelina Jolie in mind, became yet another victim of the political correct nonsense going on in our culture these days. Many were upset that Cleopatra was being cast with white women in mind. They argued that Cleopatra was black, not white. This is an on-going argument which has lasted decades now. To make things more messed up, Lady Gaga is fighting to play the role. Of course, people weren't too keen on this since the pop star now actress is a believer of all things identity politics and think she shouldn't even think about it. For a long time, historians have been saying Cleopatra was of Macedonian/Greek descent. It was impossible for her to be black. But those who believe Cleopatra was black only think in the terms that she was a ruler of an African country, therefore she must be black. 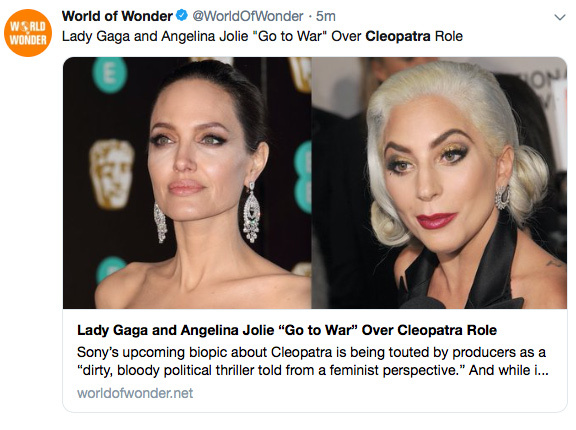 Regardless of this nonsense, isn't Angelina is a little too old to play Cleopatra, who was reportedly in 18 years old when her rule began? As for Lady Gaga being cast in the role, that's totally ridiculous. Good luck with the makers of this ill-fated project. This movie should have an actress who is young. The TV Miniseries from 1999 had an actress from Chile play Cleopatra and she was only 17 at the time of filming. This version is one of the best of all Cleo movies made. Her skin is more of a bronze tan I think. Actor Billy Zane plays as Mark Anthony and does a good job. Movie was made in Morocco. I agree this is a doomed project. The subject of Cleopatra has been filmed so many times that I doubt there is anything new to say. During the silent era Cleo was portrayed in 1917 by Theda Bara. Unfortunately this film has been lost. The Cecil B. DeMille Claudette Colbert version of 1934 is by far the best treatment of this topic. The Liz Taylor version is simply a bloated mess. Thanks for taking a firm line on this PC nonsense alleging that Cleopatra was black. Do we really need another version, especially one which is tightly tailored to the bloated PC culture ruling movies and TV today?? BBC has for a while now cast black actors in historic roles for the sake of diversity; friar Tuck in their latest Robin Hood, Achilles in "Troy: The Fall of a City", Queen Margaret in "The Hollow Crown", Robert de Baumont in "1066: A Year To Conquer England", plus mixed color families in their animated "A History of England". What I would appreciate more is that the media would actually focus on making shows and movies about characters of of certain ethnicity, celebrating that instead of shoehorning them into places where they'll only appear an awkward addition. For my money, the best Cleaopatra so far is Lyndsey Marshal in HBO's "Rome." I've been dreading the Jolie Cleo for years. I would hope she realizes she is far too old for the part. I love Lady Gaga...but not as Cleopatra. Some may consider the 1963 version "a bloated mess" but it is by far the most historically correct and the definitive scree version. It can't be bettered. And every time I hear that Cleopatra was black I want to scream. She was of Greek descent.